From Elie Wiesel, a recipient of the Nobel Peace Prize and one of our fiercest moral voices, a provocative and deeply thoughtful new novel about a life shaped by the worst horrors of the 20th century and one man's attempt to reclaim happiness. Doriel, a European expatriate living in New York, suffers from a profound sense of desperation and loss. His mother, a member of the Resistance, survived World War II only to die in an accident, together with his father, soon after. Doriel was a child during the war, and his knowledge of the Holocaust is largely limited to what he finds in movies, newsreels, and books - but it is enough. Doriel's parents and their secrets haunt him, leaving him filled with longing but unable to experience the most basic joys in life. He plunges into an intense study of Judaism, but instead of finding solace, he comes to believe that he is possessed by a dybbuk. Surrounded by ghosts, spurred on by demons, Doriel finally turns to Dr. Therese Goldschmidt, a psychoanalyst who finds herself particularly intrigued by her patient. The two enter into an uneasy relationship based on exchange of dreams, histories, and secrets. Despite Doriel's initial resistance, Dr. Goldschmidt helps to bring him to a crossroads - and to a shocking denouement. 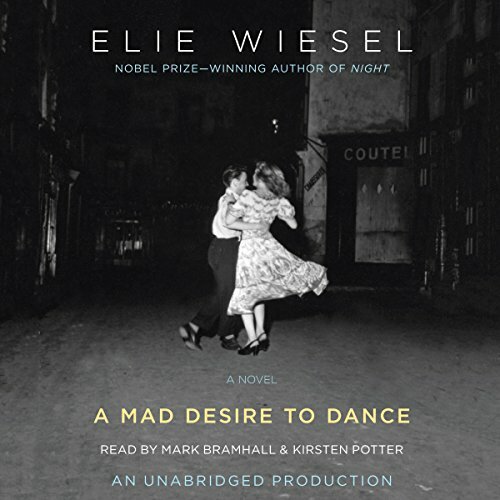 In Doriel's journey into the darkest regions of the soul, Elie Wiesel has written one of his most profoundly moving works of fiction, grounded always by his unparalleled moral compass. Elie Wiessel once again passes to us remembrance of the Nazi concentration camps. Here, in a fictional work, Wiessel tells the story of Doriel Waldman a Jewish New Yorker and Holocaust survivor who seeks help from a psychoanlyst who is also a surviver. Doriel is wonderfully articulate, introspective and self aware. Wiesel allows the reader to enter his mind and understand to some limited degree his experience. The narrative is easily followed. The prose takes more effort because of the Judaic images and wordplay. Elie Wiesel is troubling, but essential to our understanding of this dark period in human history. A Mad Desire to Dance is well worth every listener's time. The narration of Mark Bramhal and Kirsten Potter is excellent. The books starts a little slow--I had my doubts at the beginning--but slowly Wiesel paints a capturing psychological portrait. After listening to the first quarter of the book, I couldn't stop listening. The writing is so...different. So Wiesel. Mystical and dramatic, yet cynical and direct; theological and grotesque, yet academic and insightful. I found myself connecting with the main character a lot. Oh, and Mark Bramhall's narration is--well--it's one of the few times I would say a book is improved by the narrator. Bramhall is remarkably talented. And Kirsten Potter does an excellent job too. Beautiful and deep thoughts where only Elie Wiesel is able to bring the reader. His poetry in prose form is so profound and touching that he makes dance your mind when you read his books. I found sadly ironic the way the therapist, who studied and knows everything about psycology and humans' mind, is actually so far away from understanding the deep obscurity wrapping the main character, as if the whole human beings can't really understand how other human beings have been capable of what they did and, more importantly, what the victims have gone through, during and after the darkness. I love the bittersweet taste of Elie Wiesel's book, the way he make you smile you a heavy deep sadness in your heart and mind. I believe it is really representative of the history of Jewish people. Slow to Start but worth pursuing. I had difficulty getting involved in the story and found it required constant attention in order to keep the characters and action flowing. Would you be willing to try another book from Elie Wiesel? Why or why not? I tried this book after reading NIGHT, DAY, and DAWN. I had to put it away after I started it the first time because I just couldn't give it the attention it deserved. When I finally had time to devote myself just to the story line I found it was a good story and I was glad I took the time to finish it. The narration was good but there were times when I wasn't sure which character was speaking. If you listen to the beginning, figure out the protagonist and his navel, sleep several hours then listen to the end you're more likely to find the patience to start over and listen to the whole thing. Yes, he's a good writer but all the more reason to fault the times he strays into tedium. Alas, abridgment is always an abomination while a demanding editor is not. My capacity for angst over time was sorely tested. Is New York the haven for old men so crippled early in life they grow old gnawing at their embedded shrapnel and failing to thrive? I'm convinced that humans can be profoundly damaged and never recover. I'd like some variation on the theme but I didn't find it here. My browser gives me question marks, not stars. I give it 3 and I'll listen again with more sympathy if I ever recover from raising 4 reasonably pampered children with the survivors clamoring to be nominated for the Newberry Award for the "Worst Childhood, Ever".